Hmmm...I read those two sentences last night, and then I reread them. And though I don't have a formal job, I realized the truth of those words. Because every thing we endeavor requires some sacrifice. Whether service to the Lord or writing a blog or running a marathon, there is give and take involved. We can't do everything. Thus something is inevitably sacrificed. 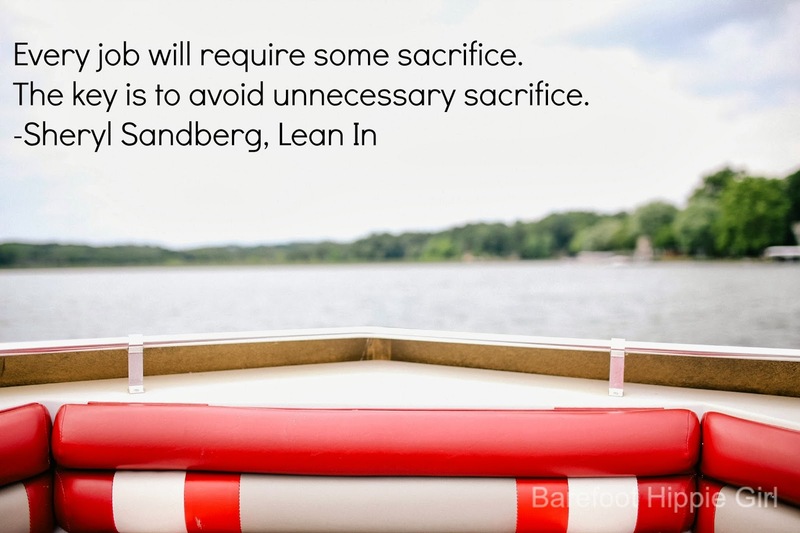 But, when and what sacrifice is unnecessary? When I was 19, I cooked at a camp in Ontario. It was situated on a river, that I swam across every day. The distance was about 1/4 mile. There and back made it a 1/2 mile. The distance wasn't the challenge. The water temperature was. Often the water temperature was only in the 50s. It was frigid, take your breathe away, cold. I'd would never jump into that water today and swim across. I wouldn't think it was worth the shock to my system. But, back when I was 19, it was just the shock my system needed. I was overweight, and consistently swimming in that river gave me confidence and was the first step on my fitness journey. It was my first "I can." And I did. I lost over 25 pounds that summer, and it was absolutely worth it. Was there anything intrinsically wrong with me jumping into that river that summer? No. Was it foolish? Not really. Is there anything intrinsically wrong with me deciding that it would not happen at this stage of my life? No. Do I think it would be foolish to jump in now? Not really. What has changed? Not the water temperature. I think age brings with it the wisdom to realize there is sacrifice with each choice and action. There is always a give and take. Age says its not worth it. The sacrifices hold them back. Youth says "what sacrifice?" Nothing holds them back. What I am looking for is the perfect median. I want the caution and wisdom of age to see the sacrifices and count the cost with the enthusiasm of youth to jump in with both feet despite the discomfort and inconvenience to me. The median says, "I am going to bike this 33 mile route. It is going to be hard as all get out. But, I am going to walk my bike up this particular steep hill. This is not the hill I am going to die on." The median embraces the sacrifice and the challenge, but weeds out the unnecessary effort that really doesn't get you anywhere. (trust me, you would have walked up the hill too) The median realizes it is better to finish than to cripple yourself for weeks. The median moves forward in valor tempered with prudence. I don't want to be bogged down with the scope of the sacrifice so that I become stagnant and static. I want to have a good perspective and a realistic outlook and then still choose to move forward in whatever God is calling me. I want to weigh the sacrifices. I want to count the cost. I don't want to lose the enthusiasm and energy of youth. I want the happy medium. Moderation not extreme. The moral of the barn/war illustrations of Luke 14 was not that the building project and battle didn't happen. But for us, nothing is often all that seems to happen when we count the cost. 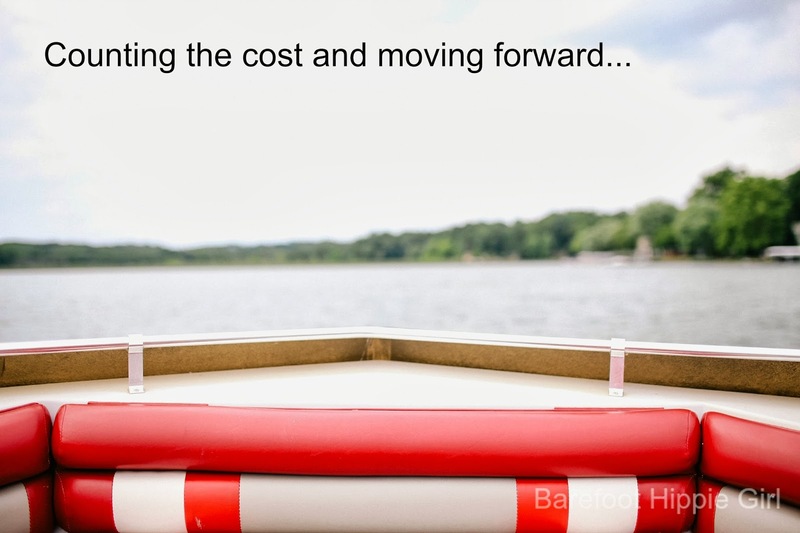 The moral of this story is preparation and then movement, not counting the cost and turning back. I want to wait on the Lord and renew my strength; because even the youths grow weary and the young men stumble and fall. I want to mount up with wings as eagles. I want to run and not grow weary. I want to walk and not faint. Those are powerful verbs, people. Action words. Moving words. We aren't called to do everything. We aren't called to do this life in our own strength. Those are unnecessary sacrifices. 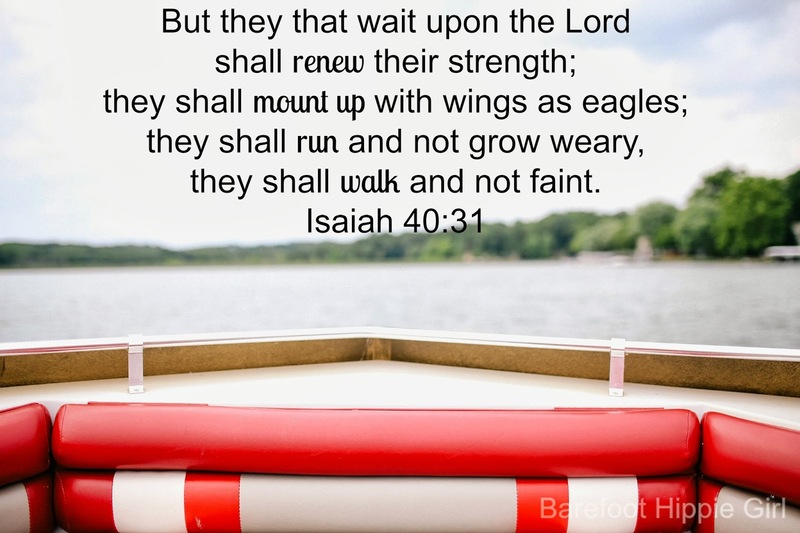 We are called to wait on the Lord in order to be renewed with His all powerful strength. God doesn't grow tired or weary. His strength allows us to mount up, run and walk. That's where I want to be and what I want to be doing. That's my heart for each one of you.